Between 2000 and 2010, per-student state support to 101 major public research universities with broad educational missions declined by an average of 3% in inflation adjusted dollars. Across the nation, state funding for major public research universities and their branch campuses increased from nearly $25 billion in 2000 to nearly $37 billion in 2010. 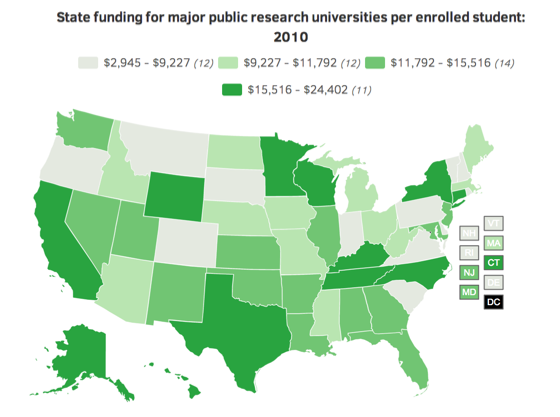 Only two states (Colorado and Rhode Island) spent less on their major public research universities in 2010 than in 2000. When adjusted for inflation, total state expenditures for major public research universities increased by 18% between 2000 and 2010, while full-time equivalent (FTE) enrollment increased by over 22%. Overall state funding per FTE student in major public research universities increased by 21%, from $10,567 in 2000 to $12,810 in 2010. North Carolina, Minnesota, Connecticut, Wyoming, Hawaii, Arizona, and New York spent more than $20,000 per FTE student at their major public research universities in 2010 – ranging from $24,402 in North Carolina to $20,075 in New York. Wyoming more than doubled its funding per FTE student between 2000 and 2010. Per-student funding in the other 43 states ranged from $17,485 in Wisconsin to $2,945 in Colorado. Eight states spent less per FTE student in 2010 than in 2000: Colorado, Georgia, Mississippi, Oregon, Rhode Island, South Carolina, Virginia, and West Virginia. The declines ranged from 36% in Colorado to 2% in West Virginia. In most of these states, funding per FTE student also decreased between 2000 and 2005. Rhode Island spent more per FTE student in 2005 than in 2000 or 2010. Of the 42 states that spent more per FTE student in 2010 than in 2000, 12 spent less in 2010 than they did in 2005.